apparent-extent: AE018 Johanna Billing "I'm Gonna Live Until I Die Anyhow"
"I'm Gonna Live Anyhow Until I Die" is the 4th soundtrack from Stockholm-based visual artist Johanna Billing. The underlying 15-minute film installation is playing in Ostia, Rome, and formulates the utopia of free access to informal learning environments. A group of young children is leaving the parental dinner party in a restaurant and starts to explore Ostia: ancient ruins, beaches, streets, green backyards and parks. The runaways gain access to an elementary school and discover a storage space filled with outdated teaching aids. The group completes its voluntary school visit by painting Rorschach images on the empty school corridor, then head back to their parents â€“ here the film loop starts â€“ still dining at the restaurant. The film was shot in neighborhoods in Ostia, where Pier Paolo Pasolini lived until his death in 1975. Johanna Billing's supervised music replays two folk themes from "Fetus", the infamous 1971 musical collage by the young composer Franco Battiato. The record is presented by Apparent Extent, Cologne, Germany in collaboration with Laveronica Arte Contemporanea of Modica, Sicily, and the book collective Dent-de-Leone, London, UK. Graphic design by Ã…bÃ¤ke, London. with Jonna Sandell, Andreas SÃ¶derstrÃ¶m, Patric Thorman, Johanna Billing and Christian Gabel at Cobra Studio, Stockholm, 201.
with Palma Biadene, Eufrasia De Mattia, Andrea Folchi, Rocco Ciardo and Leonardo Faiella at Scuola Carlo Urbani, Rome, 2011. 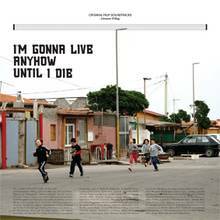 "Iâ€™M GONNA LIVE ANYHOW UNTIL I DIE" is a film by Johanna Billing, 2012, HD, Blu-Ray, 16:29 min/loop. Director of Photography: Manne Lindwall. Second Camera Operator: Tiziano Casanova. Sound Recordist: Enrico Lenarduzzi. Still Photographer and Assistant: Lauren Brincat. Editing: Johanna Billing. Color grading: Swiss, Stockholm. Blu-Ray production: Filmtech, Stockholm. Project coordination: Cecilia Canziani and Stefano Collicelli Cagol. Produced by Fondazione Sandretto Re Rebaudengo, Turin and The MAC, Belfast, with support from Iaspis, the Swedish Arts Grants Committeeâ€™s International Programme. Special thanks to: Ristorante Al Biondo Tevere, Scuola Carlo Urbani, Fondazione, Giuliani, Adrienne Drake, Chimera Poppi, Davide Ferri, Cecilia Canziani, Lauren Brincat, Daniella Gallo, Roberto Panzironi, Angelo Forestan, Swiss, Stockholm, Filmtech, Stockholm. Musical soundtrack recordings: Interpretations based on "Cariocinesi" and "Mechanics" originally written and performed by Franco Battiato on his album "Fetus" (1971, Bla Bla Records, Italy). Music Arranged by Johanna Billing along with Andreas SÃ¶derstrÃ¶m (whistling, guitar, percussion, synthesizer, pump organ), Patric Thorman (upright bass, electric bass, piano, vibraphone, percussion), Jonna Sandell (violin), Karl-Jonas Winqvist (Glockenspiel, Fender Rhodes, cembalo, cymbals) and Christian Gabel (drums), Recorded and Mixed by Christian Gabel at Cobra Studio, Stockholm. Sound mix: Joachim Ekermann at Helter Skelter, Stockholm. Mastering for vinyl: Nicholas Bussmann at Studio Beige, Berlin.